In February 2017 BOE Display announced that will establish a new R&D OLED TV production line in Hefei. According to Digitimes, BOE Display is intending to use an inkjet printing process in this line, and the company already placed an order for an inkjet deposition system from Kateeva last month. BOE will use the systems to produce 55" OLED TVs. In February BOE announced that the new line will cost 1 billion CNY (around $145 million USD). BOE will invest 80% of the funds, with the rest provided by the Hefei government. Digitimes now states that the new line will only cost 600 million CNY - so it may be that the inkjet printing line is an addition to the 1 billion CNY line (which in that case, will probably be based on an evaporation process). BOE already has a 8.5-Gen pilot line in Hefei, which is actually producing commercial OLED TV panels, albeit in very small volumes. It 2014 it was reported that BOE plans a $1 billion OLED TV line in Hefei. 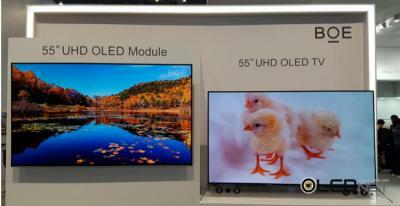 In addition to BOE's OLED TV lines, the company is also developing and producing small sized rigid and flexible OLEDs. BOE has a 4.5-Gen pilot line in Chengdu that is already producing AMOLED displays, and has recently started initial production in its $3 billion 6-Gen flexible OLED line, also located in Chengdu. In October 2016 BOE also announce a third OLED fab, in Mianyang. This will be another 6-Gen AMOLED fab (probably flexible OLED production, too). According to BOE's plans, this $6.87 billion fab will produce 45,000 sheets per month and will enter production in 2019.